I think, in part, [using iPads in storytime] depends on what age we are talking about. Certainly we should not be bringing iPads and other screens into storytimes for kids under age 2. Even with preschool children I think it’s something that needs to be thought about carefully and it would be great to have some best practices to fall back on. I do think we should be reminding parents about the AAP recommended screen time limits as I would hate for the take away for parents to be that screen time is ok as long as it’s an app. There are things to consider regarding brain development and how screen time affects that. I recently heard Dr. David Walsh speak for a second time and I think he has a lot of great info on brain development and how media affects developing brains. Too much screen time affects attention and I feel that by using iPads and more screens in storytimes we are giving a bit of a stamp of approval to screen time over book time. Both are important/useful but too much screentime is detrimental to brain development and has consequences. Kids learn through experience and using an app is not the same as an experience that happens in the real world. I do think there is value in the iPad and apps and they can be especially useful for kids with learning disabilities but at the same time, aren’t parents coming to story time for that bonding experience with their child and for the focus on books and experience and not for more technology? I think this can vary from community to community but I have had parents complain about the AWE Early Literacty Station in our children’s department at my last job and their main complaint was their kids were more drawn to the computer and it made it hard for them to get them interested in taking out books. I don’t think it’s an all or nothing proposition but I do think it’s something that needs to be added with consideration and care. What are you trying to accomplish by bringing the iPad or other technology into story time and does it add value to what you are doing? Just because it’s there and being used by others doesn’t mean you NEED to add it or that it will improve your program. Other educators generally get more time with the kids they serve so instead of seeing them for an hour each week they are working with kids on a daily basis or at least for more time than we get them in a story time. I think the Little eLit website is a great first step and at least gives people a place to start looking at what’s available and how it’s being used. Looking at something on a screen is different than looking at a phyiscal book and it is valid to look at brain development research and how screens affect that. I don’t think it’s anti-technology to have some hesitation on adding this to a story time as we should always be evaluating what we do and why we are doing it. You make a lot of good points here. I want to address just one; I too wanted to avoid using the iPad in my under 2s programs, and I always try to tell parents about the NAEYC position statement for technology use with young children. I generally don’t use book-based or educational apps in programs for under 2s, but I have realized that the iPad is often just a better presentation tool overall. If I am running a book babies program and I want to teach the moms new lyrics or songs, I put them up on the screen instead of hand-writing them out on the white board like I used to do. Then I can send them the link to the SlideShare file after the program or have it available on the library’s website. I can also have a slide with that day’s parent education tip “Repetition is good or your child!” to help second-language learners or just plain old sleep-deprived moms take more information away from the session. 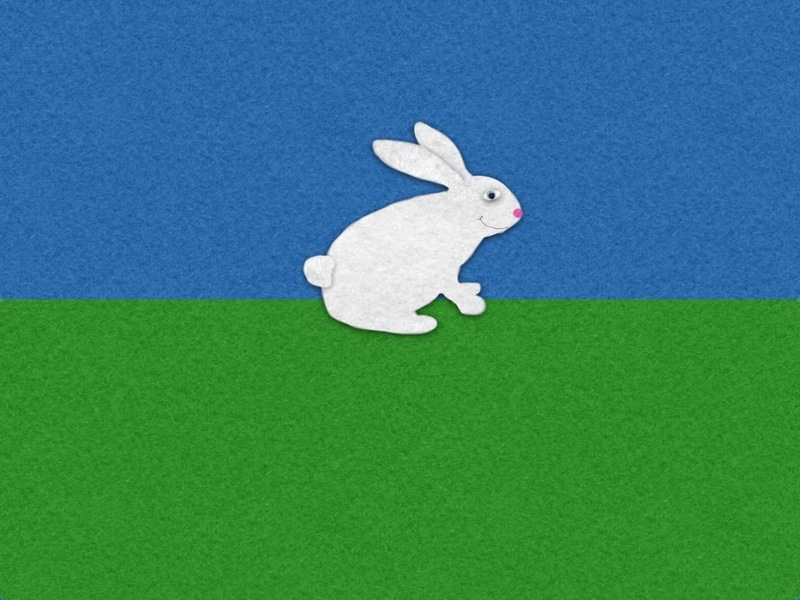 I might include a slide or two of an animal (not an app; just a Keynote slide with a picture of a bunny on it) when we do the bunny rhyme that we do every week. This provides a visual cue that we’re moving on to the next activity. I still use physical cues too; puppets, scarves, shakers, whatever; the iPad does not replace those things, it is yet another tool in the storyteller’s toolkit. We have to keep in mind that in many of our programs, a lot of the content is geared toward the parents as well as the child, and by presenting the information more efficiently to the parents, they are more likely to remember what we’ve shown them. I know of many librarians who use powerpoint or flip-charts in their book babies programs; an app on your iPad is just the next evolution of this function, and it allows for better distribution of the content. Posted on January 23, 2013, in iPad, Story Time and tagged AAP, Babies, Keynote, NAEYC, SlideShare, Under 2s. Bookmark the permalink. 3 Comments. HA! I have just now been asked to cover a Book Babies program that I started as a volunteer just after my son was born in 2009. I will be piloting a Blossom Book Babies Digital Storytime and blogging it. Another point I’d like to make about using apps in storytime is that, if done correctly it can be a very engaging experience. Sitting in front of a tv screen is a passive activity for children. When I use the iPad in storytime I try to make it as engaging as possible. I ask the kids questions, have them guess what will happen next, ask them to sing along with me, etc… Also, I agree with Cen that part of what we are doing in children’s programming is modeling to parents and caregivers. If we model how to make playing with an app an interactive experience between child and parent I think we are doing are job wonderfully. Cen, thanks so much for sharing the discussion between yourself and Mary. I found reading the different points and perspectives quite valuable. I agree modeling is important and it is what we as librarians, Children’s programmers, etc. do so well in story time. If parents/caregivers are going to be utilizing tablets and various other digital technologies it makes sense that we position ourselves to discuss, recommend, inform, guide and help in increasing the digital literacy of our program participants.